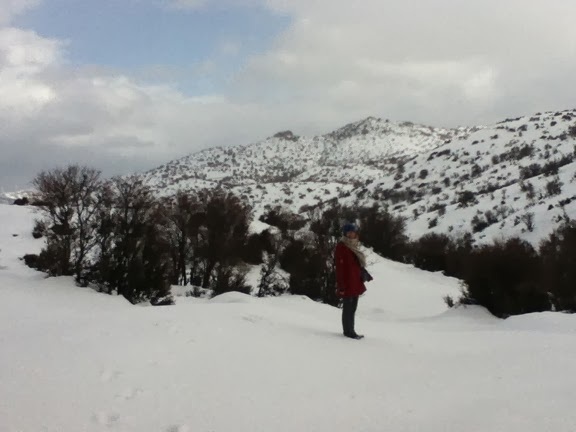 As I started to think about writing a snowy post for Crete, I realised I have been up to Mount Psiloritis to play in the snow with Sage at least 4 times. Unfortunately, I only have photos of one of the areas we explored. On this occasion, we drove up the mountain past the village of Anogia towards Zominthos, until a point where the road had not been cleared, and was un-passable unless you had chains on your tyres or a 4-wheel drive. 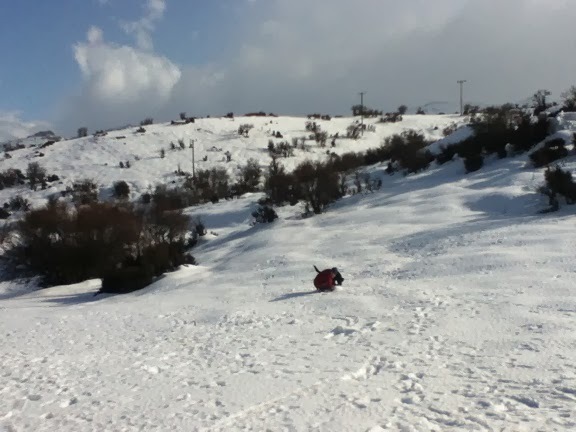 This was January 2013, and the snow was pretty deep up in the mountains. We found somewhere to park the car just off the road, and went for a play in the nearby fields. This was great fun, and Sage loved it - it was only the second time she had seen snow! I suppose I should be responsible and say that rubbish or machinery left in fields and hidden by the snow may be a danger to yourselves or your dogs, and it's safer to play on known pathways or parks. 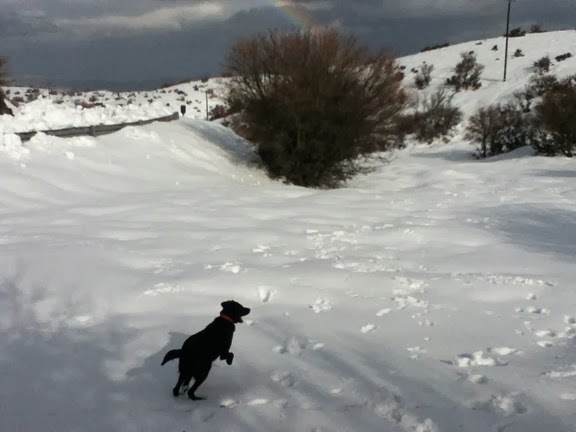 Sage's first experience of snow was up at Zaros, at the end of 2012. 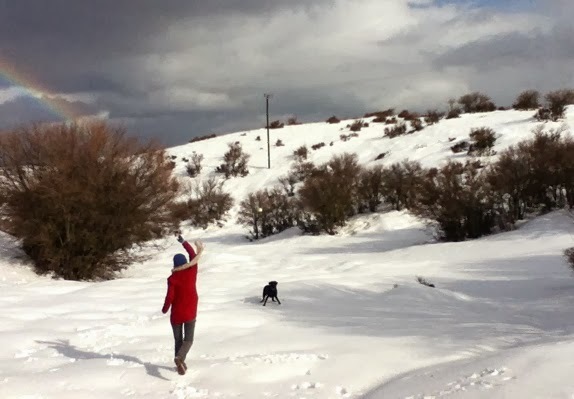 We enjoyed a walk around by the snowy lake, walked a little way towards the Rouvas Gorge, and warmed up afterwards in the dog-friendly taverna 'The Lake' (see my earlier post: http://bit.ly/1dva07W). Finally, last Christmas we went looking for snow, and got as far as the Nida Plateau and the Ideon Cave (where Zeus was raised). I had both Sage and her friend Mayia with me, while my friends also had their dog Betty. We did find a small amount of snow, but not really enough to play in. The cave was quite spectacular, and we found plenty of wild spaces around to let our 3 dogs have a run around, but continuing up the path from the cave would have been a longer, better hike away from other people. We tried to take our dogs into the taverna at the bottom of the path up to the cave, but were asked to keep them outside which we didn't want to do in such cold, snowy weather. In this area there was nowhere else to go to warm up. 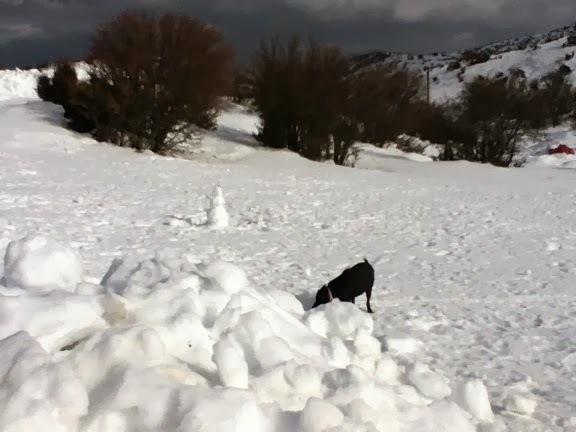 There is snow at the peak of Psiloritis for much of the year (until about May) and there are many nice places to go and explore with your dog. There are some great places for hiking, interesting villages to visit, and a few dog-friendly establishments for warming up afterwards!